Today we had an early start because the bus was to depart the hotel at 8am. I was feeling better today however Rhian was starting to feel a little off. Our tour guide Krisizti was very excited about today be for her we were going home. After our lunch stop we went into a very detailed talk about Budapest. I think the bus driver told her to take a breath more than once. She was very excited to tell us about her home. When we arrived in Budapest we went straight into the driving tour. Our first stop was at Citadella. A fortress built on top of the hill. 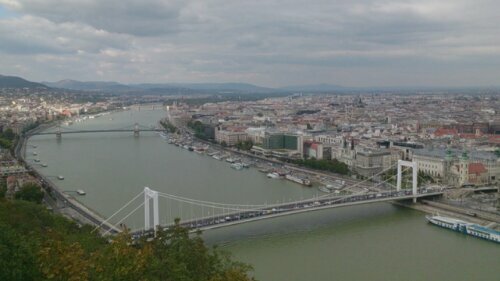 This also happens to be the highest point in Budapest and was located next to the hotel below. 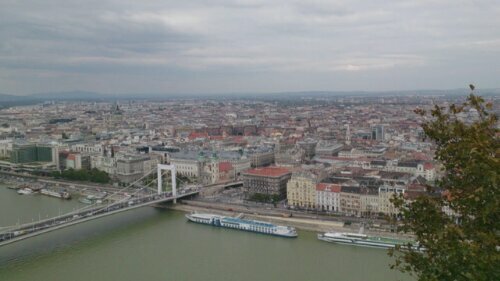 We got out and took some quick photos before piling back onto the bus for an hour driving the busy streets of Budapest. Krisizti was not able to talk fast enough telling us about every site we drove past. We also drove past the street her mum lives in. After the driving tour we checked into our hotel. This hotel was four star accomodation and very large. It even has its own thermal baths located on the first level. However working of the lift this is actually the third level. We had an hour or so free before meeting for dinner. Turning on the TV in the room the first thing that comes up is that US Goverment is in shut down. Without actually knowing what was going on I told Rhain to transfer money on the Travel card in case this meant our dollar or the US dollar was about to dive. Rhian struggled with the website but eventually was able to exchange some more euros. 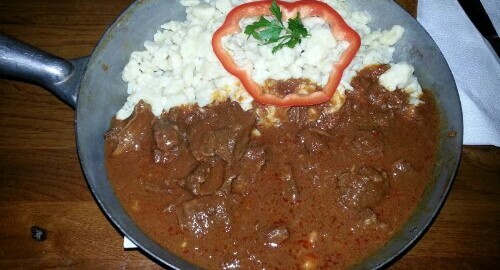 Budapest uses Floren. While we were waiting for the money to transfer we went downstairs to the atm and exchanged just $100 Euro worth to last us our stay. We then headed to dinner with the group. Many of the people at our table for dinner had the traditional dish of Goylash. It is not a stew and not a soup. 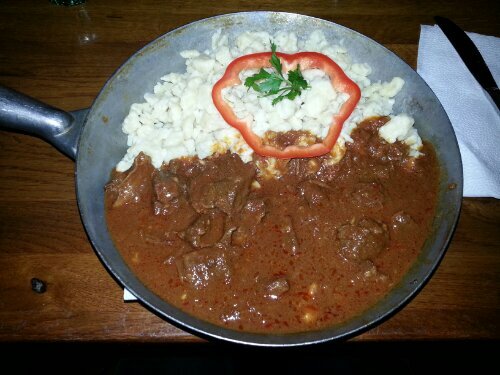 It contains meat, noodles and vegetables, seasoned with paprika and other spices. Mine came with a noodle like stuff. Was very filling. I would have it again. Others had the 1kg of Chicken Snitzchel. The prize for finishing was a high five and hug from Krisizti. I think three people finished it however I believe Beck got some help from others. After dinner we all went to a bar in town. The bar was in an old building that had been vacant but had been brought back and turned into a multi story pub. Unlike modern pubs in Australia that try to be old and rustic this place was. Rhian and I only had one drink. Hung around for a while then left around 11pm. Others stayed on until after 3am. We arived back at the hotel and went to bed.